"It is never difficult to see images - when the principle image is embedded in the soul." 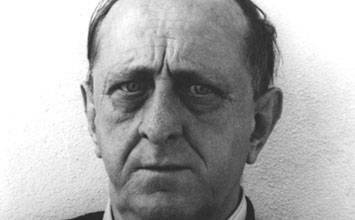 Marsden Hartley, one of the first American artists to paint in a completely abstract mode, was part of the circle of artists, including Georgia O'Keeffe, Arthur Dove, Charles Demuth, and John Marin, who congregated around and were promoted by photographer Alfred Stieglitz. Hartley incorporated into his own paintings the abstract trends that he witnessed first - hand during his time among avant-garde artists in Europe during the 1910s. While his early abstract style met with resistance back in the States, Hartley, undeterred, continued to paint his more recognizable subject matter with the same vivid colors, sharp contrasts, simplified forms, and ambiguous space that he mastered early in his career. His landscape paintings, imbued with the spirit of 19th - century American Transcendentalism, as well as his later portraits, which convey a love for and the earnestness of his subjects, are a uniquely American version of modernism that continue to resonate among younger contemporary artists today. While initially known for his more radical abstractions, Hartley used formal devices, such as strong colors and simplified forms, to convey the weightiness and groundedness of his preferred subjects, whether landscape, portraits, or genre scenes, that created a tension with the two-dimensionality of the picture plane. Unlike his colleagues, Hartley spent several extended periods of time away from the United States, living in various parts of Europe as well as Mexico. These experiences exposed him to a much wider swath of avant-garde activity than was available in the U.S. as well as extended encounters with unfamiliar landscapes. One of the results of his travel, however, was an isolation from his fellow artists, which Hartley both welcomed and lamented. Not a traditionally religious man, Hartley was steeped in the spiritual ideas of 19th-century Americans Ralph Waldo Emerson, Henry David Thoreau, and Walt Whitman. Additionally, he was drawn to Eastern religions such as Buddhism and Hinduism and was familiar with more esoteric traditions such as Theosophy. Hartley's own syncretic spirituality pervades many of his paintings, especially his landscapes. While he rarely discussed his private relationships in public, many now surmise that Hartley had several homosexual relationships throughout his life. At various points, he commemorated these relationships - more subtly in his early painting and more overtly in his later paintings - making Hartley an important early touchstone for gay identity in the United States. Edmund Hartley was the youngest of nine children born to English immigrant parents Thomas and Eliza Jane Hartley. The death of his mother when he was eight years old affected him profoundly; many years later, Hartley explained, "I was to know complete isolation from that moment forward." His family was soon after divided, with Hartley forced to live with an older sister in Auburn, Maine. To assuage his loneliness, he found solace in the comforting embrace of nature, something he would cling to throughout his life. Hartley's love of the outdoors also led him to imbibe the writings of American Transcendentalists Ralph Waldo Emerson and Henry David Thoreau in addition to the poetry of Walt Whitman. The outline of tall brown tree trunks and evergreen branches are barely visible in the flurry of loose brushstrokes that comprise Hartley's Winter Chaos, Blizzard. The shades of blue, pink, and white dabs of color that fill the rest of the canvas show the winter storm that envelops the tree-lined mountain landscape. This work provides an important example of the Impressionistic style in which Hartley rendered his early landscape scenes; and yet, as noted by historian Gail R. Scott, the approach is distinctly his own and more direct in both subject matter and color application than the "gentle atmospheric snow scenes" of other contemporaneous American artists painting in the Impressionist style. The painting also exhibits what would be a lifelong theme in his work, drawing inspiration from personal experiences with nature; here the rough, stormy winter he experienced in 1908-09 when he lived alone in North Lovell, Maine. While Hartley quickly moved on from Impressionism, these works garnered him early attention. They were well received when shown in Boston in 1909 and led to dealers Maurice and Charles Prendergast connecting the artist to William Glackens and his group of like - minded artists in New York City with whom Hartley would begin creating early modernist works. A large brown mountain occupies two-thirds of the canvas in the background of Hartley's painting. Set under a gray sky and threatening winter storm clouds, a simple one story house is depicted in the center of the painting in front of the mountain. In the foreground is a rocky landscape with barren trees that curve into the center of the composition. This work is an important example of one of Hartley's earliest series, the Dark Mountain paintings. This work, which is more somber than anything Hartley had created prior, shows the sway of American artist Albert Pinkham Ryder, whose works he saw in 1909 and who he met later that year. Hartley was immediately drawn to Ryder's ability to capture nature in a dramatic way and in response to seeing Ryder's work, he stated, "...it had a sense of realism besides that bore such a force of nature itself as to leave me breathless." With its monochromatic colors and loose gestural brushstrokes, which Hartley would embrace throughout his career, the artist used the brooding landscape to explore his own emotions. The mood is evocative of loss, even death, and Stieglitz intimated that Hartley was, in fact, having suicidal thoughts at this time. Abstract forms in vibrant shades of green, orange, red, and yellow outlined in black lines dominate Hartley's Musical Theme (Oriental Symphony). References to music, such as staffs, clefs, and notes, abound in the painting as does religious imagery, including references to Buddhist and Indian religions as well as mystical symbols such as the eight - pointed star. Hartley was not a traditionally religious man, but he was steeped in the writings of American Transcendentalists such as Ralph Waldo Emerson and Hendry David Thoreau. Additionally, in 1907 he spent several months at a utopian religious community, Green Acre, in Eliot, Maine, which engaged in comparative studies of world religions and was home to Theosophists and other mystically inclined visitors. Here, Hartley immersed himself in reading and had numerous conversations with the members of Green Acre. His interest in Eastern religions likely began at this point. The musical references found in this painting are more directly linked to his exposure to artist Wassily Kandinsky and the works of the German Expressionists of the Der Blaue Reiter (Blue Rider Group) during his first European trip in 1912. While Hartley employed musical symbols, we also see him making references to music through the rendering of paint on the canvas as well as taking on an improvisational approach to mark making. One can also see influences of Picasso's Analytic Cubism in the way Hartley structured his composition. In many ways this immersion in modern European painting helped to advance Hartley's career, yet it would also be the thing that slowed his artistic advancement once he returned to America, where the general public and even many critics were less ready to accept the unfamiliar and distinctly European approach to art. Hartley's painting Portrait of a German Officer is replete with diamonds, triangles, circles, black and white lines, and rich shades of red, blue, green, and yellow. Additionally, we see symbols including the Iron Cross and reproductions of German military emblems and flags. The arrangement of these shapes and symbols creates an abstract collage that is at once formally interesting but seems equally mysterious in its meaning. Georgia O'Keeffe commented that Hartley's German paintings were "like a brass band in a closet." This work is part of one of the most important and best known series of Hartley's career, his so-called German Officer paintings. While showcasing his mastery of Cubism, it is also a key example of how personal experiences helped to shape the themes that Hartley explored in his works. Germany fascinated him from the moment he arrived and, in particular, the military customs and pageantry caught his attention. Intended as a tribute, this painting makes reference to the death of Karl von Freyburg, with whom Hartley had been (believed to be) in love, and who died in battle in October 1914. Hartley later stated that the painting "stood as a symbol for all that is inspiring in young life." The letter "E" stands for von Freyburg's Bavarian Eisenbahn regiment, and "24" his age at death. It was not, however, the subtle references to homosexual love that proved controversial but rather what many felt to be praise Germany and their military action. Hartley's refusal to outright denounce Germany and his continued interest in the country made him a lightning rod for controversy among American audiences and hindered the development of his career. Importantly, though, Hartley's painting partakes in the modernist rethinking of portraiture that was being carried out by Picasso, Gertrude Stein, and his American colleagues like Charles Demuth and Florine Stettheimer, among others. The painting is roughly the height of a person, emphasizing its human subject. While Hartley did not paint the physical likeness of his deceased friend, the symbols collaged together make an abstract portrait. As art historian Jonathan Frederick Walz has argued, the disappearance of the subject's physical likeness in the portrait points to changing notions of subjectivity in the first decades of the 20th century. Hartley returned to Europe in 1921, and in the late 1920s he lived in southern France, in the province of Aix - en - Provence, where the inimitable Paul Cézanne had lived decades before. Inspired by the landscape and Cézanne's own rendering of it, Hartley depicts Mount Sainte - Victoire in this luscious landscape. In the foreground a tree - lined path leads the viewer's eye to the mountain in the background, which is rendered in bright shades of pink and purple. Hartley's skill and individuality comes through in his rendering of this familiar mountain range, with more vibrant colors and more delineated forms than Cézanne's. American modernist scholar William Agee in describing Hartley's unique approach states, "They are, to be sure, an act of homage, but the results are startling. The touch is rougher, the image more condensed, the contrasts often sharper than those found in Cézanne; but finally it is the range of hue and the range of light effects that makes these works so original and such marvels of the art of painting." Here, Hartley shows a rare trait: an artist who can pay tribute to and paint in the style of artists before him without becoming a mere copyist, instead offering a new and, in this case, more modern approach that builds on the work that has come before. Importantly, Hartley was not just looking at Cézanne's paintings but the physical landscape that Cézanne himself saw. Experiencing the landscape personally was crucial to Hartley's paintings. Hartley's earlier thoughts on the New Mexican landscapes that he painted rings true a decade later in France. Hartley stated, "[T]he American painters must first learn to arrive at firsthand contact with it [the landscape]. It shall not come by way of...conventional methods. It is nearer in Cézanne because he sought to establish the quality of reality, the understanding of solidity." In fact, it is that experience of solidity that Hartley wants to capture. A family portrait, Hartley's painting Fishermen's Last Supper features five people, three large men and two women between them, seated on one side of a long table, facing the viewer. The table is set with food, drink, and a bright white tablecloth that provides a strong contrast to the dark blue wall behind the family. The dining room is a traditional hutch with dishes inside, partially visible on the far left side of the canvas. Two framed paintings of boats at sea hang on the walls, and part of a sideboard is visible on the right. Hartley frequently explored portraiture later in his career, and the subjects were often people he knew well. Here, Hartley portrays the family of fisherman Francis Mason who he befriended while he was living in Blue Rocks, Nova Scotia. It was with the Masons that Hartley found, albeit briefly, a home and familial connection that filled a void in his often isolated life. The loosely rendered details of the figures and objects signal a sort of faux naïve style of painting that Hartley, the consummate outsider, would continue to explore. More than a simple group portrait however, it is also a tribute to the family and specifically the two son's Alphonse and Donny who, with a cousin, drowned at sea on September 19, 1936. Having been with the family at the time of the tragedy, Hartley felt the loss deeply, and there was later some speculation of romantic feelings for the sons on the part of the artist to the sons. Hartley never mentioned such feelings, but if true, as with his previous lover Karl von Freyburg, this depiction is magnified by his grief. The artist created two versions of this work; the earlier one is more overt in its acknowledgement of the loss, including eight - pointed stars above the two sons' heads to indicate their death and the inclusion of text written on the tablecloth. However, in this later, refined version, the reference is more subtle with a faint blue halo - like shadow over the two two sons' heads and laurel wreaths placed on two empty chairs opposite them to indicate everlasting life. 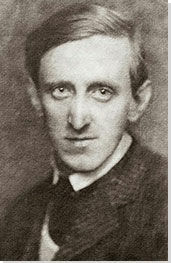 A writer as well as an artist, Hartley would immortalize the family in an epic poem titled "Cleophas and His Own" (1936) as well as shorter poems. Here, Hartley portrays a large man at the beach in a red speedo with a white and red striped towel slung over his right shoulder, which is sharply contrasted to his tanned body. Standing on the sandy beach, his body dominates the painting, filling the entire center of the canvas. Behind him is the water and a blue, cloud-filled sky. Depicted to the left of the figure is a lifeguard floatation device with a red cross painted on it and to the right a rock and in the distance an anchor. This work demonstrates Hartley's brand of modernism in which objects are rendered in a flat fashion and bold brushstrokes and color choices lend a sense of weightiness to the scene. As a result, the nearly naked figure is granted an overwhelming presence. Hartley's modernist experimentation with notions of space is also present, as the figure seems to push beyond the confines of the canvas. Hartley's figures calls to mind Paul Cézanne's Bather (1885 - 86), and as art historian Gail Scott writes, "Hartley's young lumberjack, like Cézanne's bather, is on a ground plane but not precisely in the landscape. Both come to life through a combination of traditional modeling (which gives weight and volume to the anatomy) and expressive techniques - black outline drawing and flat patches of sky between the bent arms - which in turn defy that weight and compress the figure into ambiguous relationship with ambient space." While clearly an homage to Cézanne, Hartley's choice of subject is curious. A lumberjack, who one associates with the forest wearing jeans and flannel shirt, is here portrayed in his bathing suit on the beach. As art historian Randall Griffey eloquently describes, "Hartley's decidedly anti-academic, intentionally unrefined technique imbues the figures with an alluring combination of toughness and tenderness, an unconventional sensuality that renders them immediate yet remote." Griffey points out that Hartley daringly exhibited his private homosexual desires at a time when homosexuality was widely policed and criminalized.